Director Kenneth Branagh uses Agatha Christie‘s renowned source material to reintroduce the world to her most beloved detective, Hercule Poirot. Poirot is obsessed with balance reads Dickens for enjoyment and cannot abide by polite conversation. Branagh plays Poirot with such grace and charm that one can’t help but be swept into the classic story and sweeping imagery despite the dated xenophobic ideas of many of the characters. Hercule Poirot is the best detective in the world and he is in high demand. The film opens with him solving a case at the Wailing Wall in Jerusalem. British authorities arrive the moment the case is closed to whisk him away for another job. 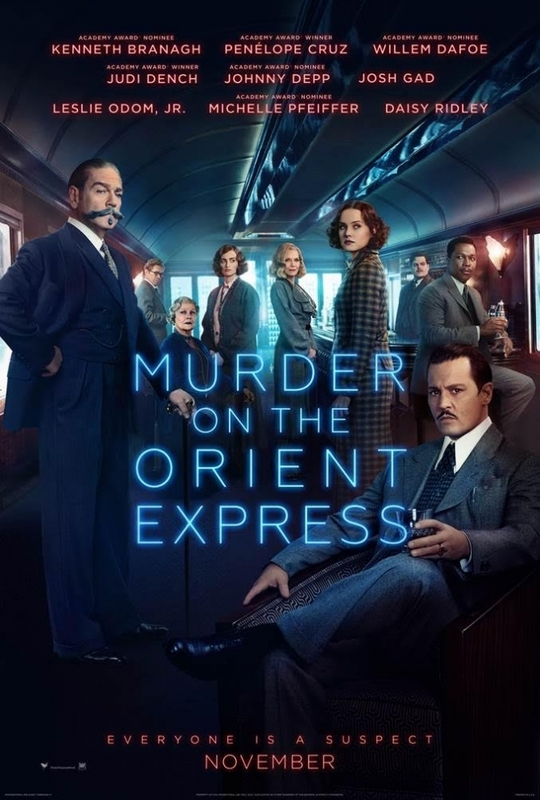 He runs into an old friend who offers him a three-day escape on his luxurious train, the Orient Express. He accepts the offer in hopes of finding some much-needed rest. The rest does not come for Poirot as a murder and an attempted murder are committed in quick succession. Who was the killer of the burly, surly American businessman Edward Rathchett (Johnny Depp)? Could it be the modest and delightful governess Mary Delenham (Daisy Ripley)? Or the worldy seductress Caroline Hubbard (Michelle Pfeiffer)? We meet these characters and several others as they bob and weave through the lush cabins aboard the Orient Express. Art deco lights warm the rich brown wood and soft tablecloths that create the delicious setting for the classic whodunit. The miserable winter weather overtakes the train as an avalanche blocks its path. The passengers are forced to remain together in the confined space knowing that one of them is a killer. Branagh makes viewers feel the chill in the air and the warmth of the cabins with masterful swirling snow, blues outside, oranges inside and a foreboding sense of doom as the train is stuck on a precarious wooden bridge. Visually the film is stunning. Beautifully framed shots, sweeping landscapes, majestic train shots and most noticeably, aerial shots of the murder scene all enrich the viewing experience. The costumes are as diverse as the characters and are tailored, designed and worn with aplomb. Every visual component of the film is enchanting. The phenomenal cast balance well off of each other and each has glowing moments to their performances. Derek Jacobi (Edward Henry) has a particularly touching scene with longtime collaborator Branagh. Some viewers will be put-off by the very un-politically correct dialog between the characters. While I admire that the intention of keeping these lines in the script was to keep the material true to its original source, it is hard to stomach in today’s volatile culture. That said, it’s worth pushing aside this discomfort to receive the true message of the film, every life is valuable and the taking of any one life can permanently alter the worlds of infinite people rippling off of that loss.